In the wide garden of Mimurotoji Temple in Uji there are 30 different kinds of hydrangea some of which seem to have the shape of a heart. June and early July is the perfect time to see these beautiful flowers in bloom. Known also as the "flower temple," Mimurotoji Temple also draws visitors to its cherry blossoms in spring, azaleas in May and lotus flowers in July and August. Mimurotoji Temple's buildings include a three story, vermilion pagoda and the Main Hall, built in the early 19th century and containing an image of a thousand-armed Kannon. 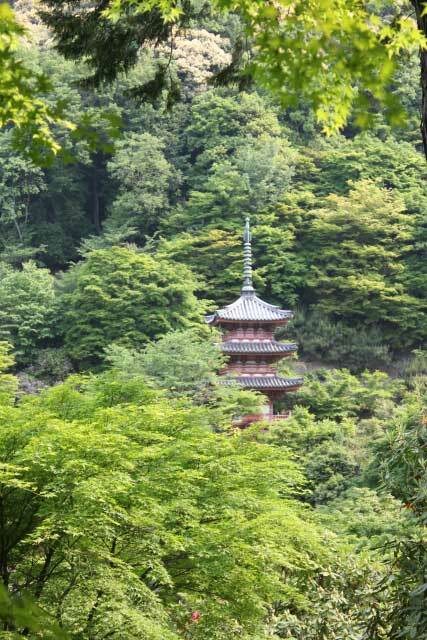 To get to Mimurotoji Temple from Kyoto, take the Keihan Line from Sanjo Keihan Station or Demachiyanagi (change at Chushojima) or the JR Nara Line to Uji. From Uji Station and Keihan Uji Station the number #43 bus runs hourly to the temple. The nearest station is Keihan Mimuroto Station from where the temple is a 15 minute walk.